It’s a common housewives’ tale that if it rains on your wedding day you’ll have good luck, prosperity and fertility. But what do you do when that day comes, and your finely planned wedding can no longer happen the way you imagined it would? Let’s be honest here, most of us would probably freak out. However, this hiccup in your wedding day can almost always be avoided if you have a knowledgeable wedding planner on your team. During the summer months here in Florida you can almost set your watch by the afternoon storms that roll in and you can be sure that mother nature starts her daily uproar right when your ceremony is supposed to begin. 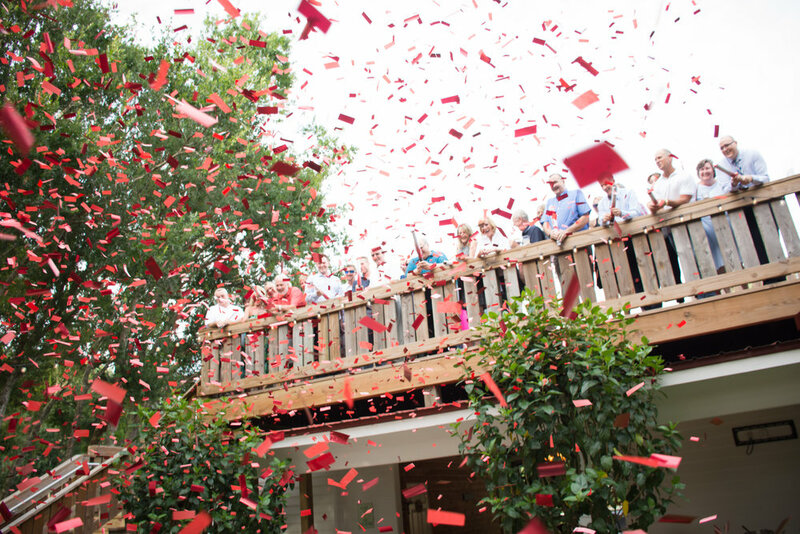 Being that Magnolia Manor is an outdoor venue, several steps and precautions have been put into place to make sure that whether rain or shine our brides leave happy and dry. If it rains on your big day, embrace it, after all there’s really nothing anyone can do to make it stop. For some brides the rain is actually a blessing in disguise. Several things can change due to the weather: it can bring down the scorching temperatures for something more tolerable for guests, it can create a unique look for wedding portraits and it can change the atmosphere of the entire wedding by bringing it into a more intimate setting. During this past wedding season one of our brides encountered this first hand. As the rain began to fall the morning of her wedding, we made the decision to bring the ceremony and cocktail under the covered barn. Under the dimmed wagon wheel chandeliers and down a candle lit aisle our bride and groom were married in front of an elegant white sheer arbor as guests watched from their tables. Just by making some minor changes and embracing their wedding day weather, this couple ended up with something that they didn’t even know they wanted but were over the moon about in the end. On the opposite end of the spectrum there is a real difference between a light afternoon rain and the monsoons that come with tropical storms and hurricanes. Being an outdoor venue, we have regulations and procedures that are put in place but if mother nature decides she’s going to let a tropical storm roll in the day of your wedding. In all reality you have one of two choices: roll with it or cancel it. That’s exactly what we had to do in October 2017 when a last-minute tropical storm came through Vero Beach. Handling the situation with grace our bride trusted us to make sure that her wedding still went off without a hitch. Whether it was walking the 150 guests to and from the barn under the cover of oversized umbrellas or putting up clear side paneling so that guests could stay dry while they ate, every detail was considered. When the clouds cleared, and the wedding was over it was almost as if no one had even noticed the storm that had occurred. Not every venue has to worry about weather, but some of us do, and it is always prudent to have a Plan A, Plan B and even a Plan C. With our brides who have a guest count over 75 we always suggest that they think about bringing in a tent. This call is made 72 hours prior to the wedding and saves the guests from being drenched and the ceremony being delayed. We work hard to make sure that our brides vision comes to life but we also know that mother nature likes to throw us a curve ball every now and again and it is best to be prepared. For some rain can be the worst thing to happen on their wedding day, but for others it turns into a true blessing in disguise. Honestly, it all comes down to how you embrace your particular situation. If your venue has a back up ballroom, then move inside. If it looks like it will only sprinkle for a few minutes, hold off on the ceremony. Remember if it rains on your big day, take out those cute rain boots and umbrellas and trust your planner, because in the end you’re still achieving your one true goal of getting married to your best friend. A little over two years ago, Magnolia Manor opened up and became a premiere destination for brides throughout Central and South Florida. What many of you do not know is that this venue isn’t just for brides anymore. Over the past few months they have been partnering with several local Vero Beach businesses for their employee appreciation events and corporate fundraisers. 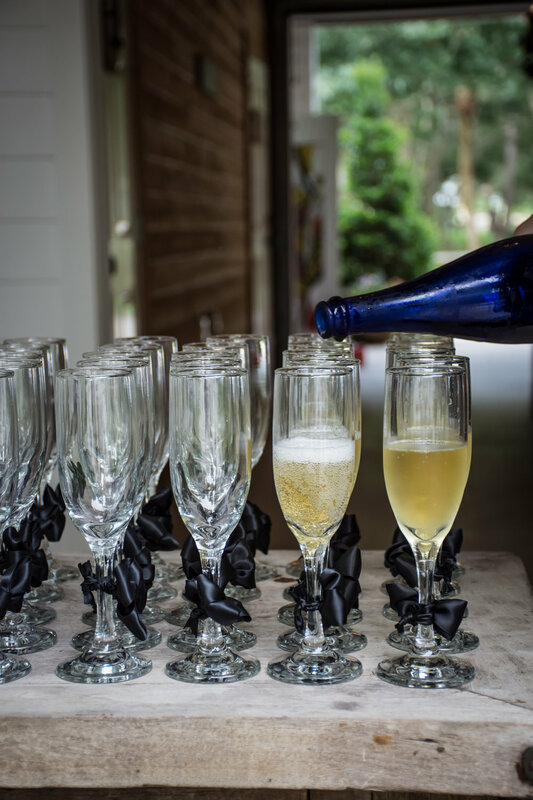 Not only have business’s been utilizing Magnolia Manor’s 10-acre rustic property but several private social events have been held within their grounds as well. With an open-air bar, unique cocktail and bar space and enough parking for a small city this property definitely has it all. This past June they hosted an extravagant Casino Royale themed event for a local business man’s surprise 60th birthday. Now I know what you are thinking, how did they turn an outdoor barn space into something out of a Bond movie? It took several months of strategic planning, sneaking around Vero Beach and vendors from Miami all to the way to Orlando to pull it off. Of course, the first thing you need to turn a party into a Casino Royale themed event are Casino Tables. Magnolia Manor partnered with the Orlando based Casino Events of Florida. Their tables are some of the best around and seem to come straight from the Las Vegas Strip. A total of 5 tables were brought in - one poker, two blackjack, one craps and one roulette – along with two slot machines and some amazing 5’H playing cards that really helped pull the look together. 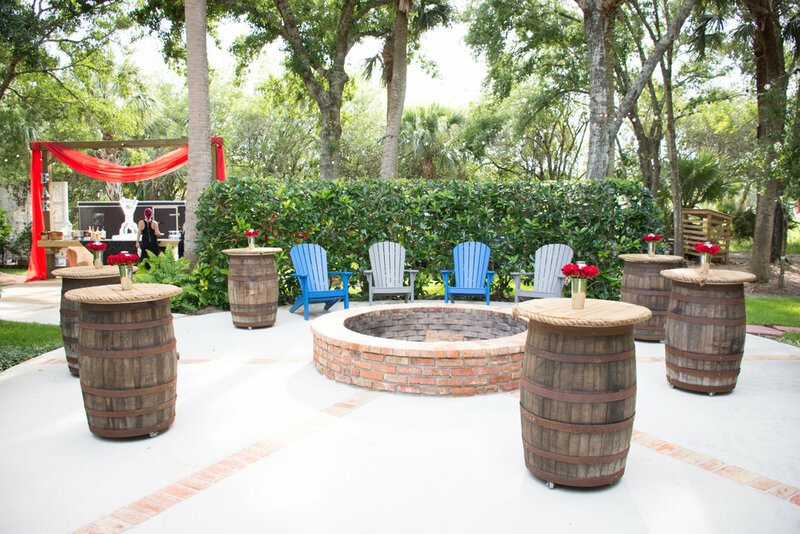 Not only did Casino Events of Florida and their team work with the Magnolia Manor team throughout the planning process but their staff during the event played up the theme, socialized with the guests and really helped the overall atmosphere come to life. Next thing you need for a Casino Party is a great bar and some out of this world food. Wild Thyme Catering, located in Vero Beach, brought this culinary vision to life. Cocktail hour was filled with shrimp cocktails, a charcuterie station and lamb lollipops that were worthy of the royalty who visit Monte Carlo. During dinner guests were invited to browse the buffet in search of their perfect meal. The buffet offered everything from a beef tenderloin carving station to salads, to twice baked potatoes and paella. Anyone who’s anyone knows that you can’t really have a birthday party without a birthday cake. For this The Cake Lady Custom Cakes, out of Fort Pierce, was called in. A decadent two-tier chocolate tuxedo cake complete with fondant poker chips was created for the fifty guests to enjoy. All I can say about this, is if you haven’t tasted her creations, it is definitely worth stopping by if you are in the area. With all these options guests left not only happy but definitely full. Now that the larger aspects of the event were taken care of it was time to turn their attention to the details. To bring this over the top event to life, Magnolia Manor rented black sequin and black shantung linen from Orlando linen vendor GBS Linens. Each table alternated between the two linens while red rose centerpieces, that were made in house by Magnolia Manor, adorned each table. Positioned in the center of the bar was an oversized martini glass ice luge from So Cool Events out of Miami. Not only did they provide this epic statement piece for the bar but an oversized “60” carved out of ice was brought in and placed next to the cake. Final touches of Red Sheer Fabric where brought in by Magnolia Manor and placed across the top of the bar and at the entrance into the barn to bring more of a casino feel to the venue. Whether you are planning a simple rustic wedding or an over the top themed event is it important to have an open mind when it comes to your venue and how you can transform it into your dream event space. Let’s say you want a garden themed cocktail party, but because this is Florida there’s a high chance of rain, so you book a ballroom to cover your bases. There are a million ways to transform that four walled space into an elegant garden reminiscent of Jay Gatsby’s. Same thing goes for Magnolia Manor. All you need is a little imagination, a dash of creativity and vendors who see your vision and can make it a reality.